How about a nice colection of repaints for us all to enjoy . If you see one that is not in this list,,, please add your entry to this list or topic , for al to enjoy . TF-FIK was red, FIJ was ochre, FIP orange, FIN blue and FIM yellow. Constructors number: 10263. Taken into service with Flugfélag Íslands on 24th April 1972 and named Glófaxi – ‘Glowing Horse’. Removed from service on 23rd March 1992 and returned to Fokker. Repaint made for FSX Acceleration, not tested with P3D. Paint for Just Flight Fokker F27 FriendShip in Brasil Central colors (PT-LCG). the real aircraft Garuda F27 MK600. Great ones , i bild the Fokker F 50 Busy Bee at the Schiphol Fokker plant . Repaint in Finnair colors for the payware Just Flight Fokker F27-100/200/300 addon. FSX Hughes Airwest Fokker F27. A repaint of the Just Flight FSX/P3D Fokker F27-200 in Hughes Airwest livery, registration N2775R (Fairchild F27A c/n 53). By Muhammad Chariri. 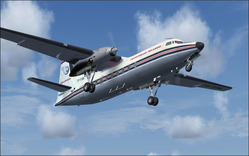 Repaint in the colors of Miniliner for the payware Just Flight Fokker F27-100/200/300 addon. This repaint is fictional, as the real I-MLXT is a F27-500. A set of repaint in the colors of the Sunwings Express Virtual Airlines for the payware Just Flight Fokker F27-100/200/300 addon. The set contains F27-100 CS-NNP (red) and F27-200 CS-NMR (blue). Fictional repaint in Insel Air colors for the payware Just Flight Fokker F27-100/200/300 addon. They look very nice , can you do a maritime version ? THIS ONE HAS A ,,CFG ,, ENTRY FOR ENGINE DEMO SMOKE !! Royal Netherlands Air Force repaint for the payware Just Flight Fokker F27-100/200/300 Friendship addon in special 1995 airshow season colors of the RNLAF F27 Display Team. Royal Netherlands Air Force repaint for the payware Just Flight Fokker F27-100/200/300 Friendship addon in hi viz colors. Royal Netherlands Air Force repaint for the payware Just Flight Fokker F27-100/200/300 addon in hi viz colors. Royal Netherlands Air Force repaint for the payware Just Flight Fokker F27-100/200/300 Friendship addon in camouflage colors. This revised repaint includes corrected bump maps, roundel position and added walkline on the wing. I prefer a Dutch MLD , but i will respect any other navy as well .